The Cowboys Leagues Club was recently proud to donate over $3,000 to Townsville Legacy, in support of the families & dependents of deceased & incapacitated veterans of the Australian Defence Force. In 2015, the Club released a limited edition Jersey to commemorate the ANZAC centenary, with $5 from every Jersey sold donated to the North Queensland branch. 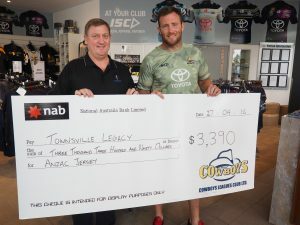 North Queensland Cowboys player Gavin Cooper was proud to present the cheque to Townsville Legacy President Mick Reilly. “The support that Townsville Legacy provides throughout the North Queensland community to families affected by the injury or death of a spouse or parent during or after their defence service is invaluable. I’m honoured that both the Cowboys Leagues Club and North Queensland Cowboys could work together to recognise and contribute to this extremely worthy organisation,” Gavin stated. President Mick Reilly was extremely appreciative to accept the donation. “On behalf of Townsville Legacy, I would like to sincerely thank the Cowboys Leagues Club and North Queensland Cowboys for this considerable donation. The reach of our organisation stretches from south of Bowen, west to the QLD border and north to Ingham and we currently care for over 700 widows and over 30 children and dependents across the region – there is no doubt that these funds will assist our hard working team of volunteers to further improve our services and facilities,” President Reilly confirmed. General Manager of the Cowboys Leagues Club, Clint Williams, is continuing to look for innovative ways to support the Australian Defence Force in light of the success of the ANZAC Jersey and positive response from the general public. “The Club certainly recognises that we are a garrison city, and we are always looking at ways to provide services & support to defence personnel and their families. The ANZAC jersey was a great opportunity to do this and we also recently introduced a discounted membership option available to defence personnel for only $2, as a token of our continued appreciation for the tremendous work they do and have done,” Clint states. The Club is also determined to carry on the success of last year’s work, with a limited edition Camo Training Tee now available to purchase with $5 from every Tee sold being donated to Townsville Legacy over the 2016 NRL season. Those looking to support Townsville Legacy and purchase the Camo Training Tee can shop in-store at the Cowboys Team Shop at 335 Flinders Street or online at www.cowboysteamshop.com.au.